I think it can get confusing for a lot of Palestinian children growing up in the US. At least for me, anyway. I was hella confused as a kid. I come from a family of Palestinian refugees. My families on both sides were ethnically cleansed from their villages by Israel in 1948. So my mama and baba had grown up in Jordan before they came to the US as immigrants. As a kid, I was always a bit confused as to why my family came from Jordan but we’re Palestinian. I knew I was Palestinian, but I didn’t understand exactly. When I was in elementary school, there was an International Week in which we learned about different cultures. For one of our activities, our teacher told us that America is a nation of immigrants, and we all came from somewhere. The teacher went around the room and asked us where our parents or grandparents, etc immigrated from. When it was my turn, I said Jordan. One of the activities she had us do later that week was to place a pin on a map of the world indicating where our families come from. There was no Palestine in sight. Just Israel. I went up to my teacher and said, “I think the person who made the map forgot to put Palestine? It’s not there.” She replied, “but I thought your family was from Jordan? Jordan is right there, hun.” I said, “Yes, we immigrated from Jordan, but we are Palestinian so that’s where we’re from.” She apologized and seemed puzzled. She said for now, that I should just put it on Jordan since we can’t find Palestine. I did that. She also gave us these cute flag stickers from where our families immigrated. Again, I got Jordan. No Palestine flag stickers were available in the set. There were frustrations and confusions I had a lot as a kid whenever there was something international. For example, I always wondered why there were no Palestine flags in Chicago’s O’Hare International Airport. Everyone else had a flag there. As I grew up, of course, I realized why our flag was never there or why we weren’t recognized on many maps. I became comforted by the fact that we still identify as Palestinians and we still hold on to our culture and traditions dearly. We still exist. Over the years, though, I became super interested in looking at historical maps of Palestine and collecting Palestine maps and flags. Even now, I have more than enough of these trinkets displayed in my room. The red is tomato, something Palestinians use in so many dishes, from bamya to kayalat bandoura. We even eat it plain and simple for breakfast alongside sliced cucumbers, eggs, hummus, labne, or zayt w za’tar. Speaking of zayt, I put black olives in for the black part of our flag. Although I personally prefer green olives over anything, there are olives of many colors, shapes, and sizes in Palestine. And of course, olive oil is essential to all Palestinian cuisine. For the white part, I spread in some labne. Labne is cheese made from strained yogurt. You’ll find this in any Palestinian home. It’s delicious, especially when drizzled with olive oil and eaten with fresh pita bread. Finally, for the green, I laid out some parsley. Parsley is the major ingredient used in tabouleh, a traditional Levantine salad. It’s my favorite salad, ever. There are so many other combinations you can make with the Palestinian flag. We have such a rich, wide array of Palestinian cuisine. We’re so fly when it comes to food that Israel tries to appropriate our cuisine. Israel took our homes and our land, and the next step in attempting to erase the history and existence of a people is to appropriate their food and culture. No matter what, though, our identity and our culture will be maintained because our people are maintaining them. This is part of our resistance. I will continue to learn my family’s history and culture and pass it down to my children one day, inshallah. I will continue cooking Palestinian dishes. I will continue doing dabke. Even if my children grow up noticing that the Palestine flag is not recognized or that Palestine is not listed in this or that thing, they will know that Palestine is there and always will be there. Palestine will always live inside of us. In the first Intifada, israel had this brutal policy of shooting and arresting those carrying Palestine flag. I know ppl who spent 6 months in prison of possessing Palestine flag. The harsher and more bigotted israel’s hate of Palestine grew, the more attached to it we became. We painted the Palestine flag everywhere: or almost every wall, and on books, and booknotes. The Palestine flag was waving from high buildings and from very very high trees. And finally, we turned our kites and other kinds of paper and string kites into Palestine flags. Nothing prevents Palestinians from loving their flag, let alone their Palestine and their land. oh this is really awesome loverly. thank you. we need this for mondoweiss. I like it a lot. Thanks. Thank you for this wonderful message. I am working on a booklet to be published by the Presbyterian Church (USA)’s Israel Palestine Mission Network. This booklet would feature Palestinian Narratives. Would you be willing to include this blog as a narrative? You are right. Great job…….And…….Nicely Done! Love this! Brought tears to my eyes. I had similar childhood experiences. Makes me sad that our children will go through the same thing. On the other hand, it is this very thing that will ensure that “the young will NOT forget”. Hopefully going through this will motivate them as it did us. Love how you did the flag. The fresh ingredients are wonderful! 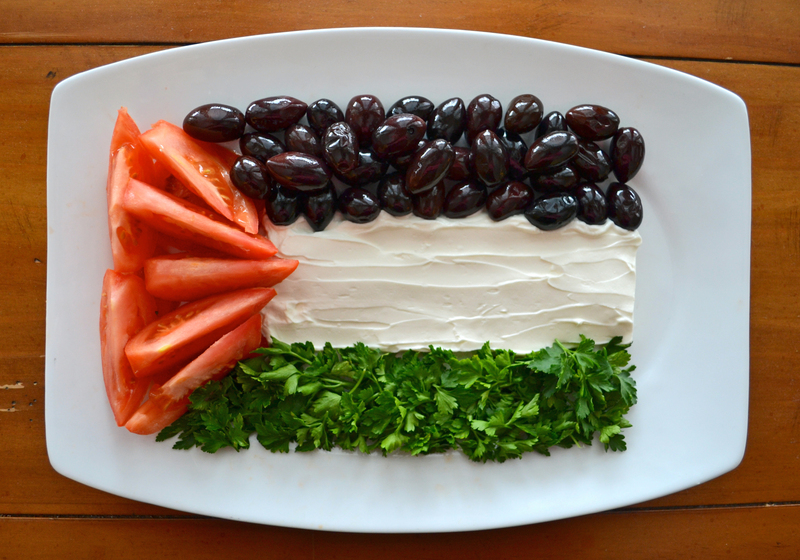 My son has an International Day this week and I will use this idea for the flag on Palestine’s table. Tarshiha is my husband’s family’s hometown but they are refugees in Lebanon. Divestment from Israeli apartheid: Will you be part of history?